Little Hetty looks just like her grown up sister with a few important modifications. For a start while there is a cable and plug provided, it doesn't plug into the mains electricity supply. Rather a sucker allows it to attach to something like the skirting board. 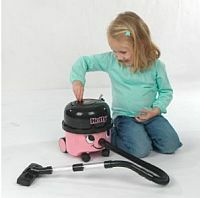 Instead of a wall socket Little Hetty gets her suction power from 4 'C' type batteries. With this she can pick up small items like pieces of paper or poly beads and collect them in a removable drawer. 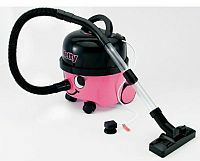 The Little Hetty Toy Vacuum Cleaner comes supplied with a small dustpan and brush, hose and 'T' shaped nozzle and these accessories can be packed away inside the body (where the dust bag normally goes). The simulated power cord is reeled in by turning a handle just like the real thing. 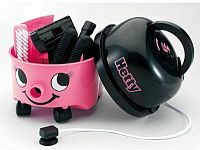 One note of caution, Little Hetty is made by Casdon, not Numatic (who make the real Hetty) and so while OK for pretend play, she's not as durable nor does she provide a useful level of suction to actually clean anything. Buying online normally gets you the best prices but it can be difficult to find a supplier you trust. Fortunately Amazon have started selling all sorts of things other than books and DVDs and that includes the Little Hetty Toy. Here are links to both the UK and US Amazon stores so you can see the latest price and pick the store closest to you. Oh, and remember there is a Little Henry Toy if you'd prefer red. Check out the price difference too.